Combine learning activities in the galleries with a related hands-on art making experience in the museum's Education studios. Your students will bring inspiration and insight from the museum's collections to their work. Gallery / Studio Workshops combine a 30- or 60-minute docent-led tour with a 90-minute studio workshop led by an experienced museum artist/instructor. Choose a subject and a medium, or let us help you design a workshop that supports your curriculum and your schedule. One 90 minute workshop, up to 12 students $205; 13-24 students $245. Additional materials fee per student for clay, fabric, acrylic paints, and photographic and mosaic materials. Please inquire while making workshop arrangements. Please inquire about alternative schedules if needed. To schedule a workshop, please call 508.793.4338. Four weeks advanced notice is required. Students will understand the history of metalwork (tooling) in the Ancient Aztec cultures of Mexico. They will learn a process of creating designs in sheet metal, using thick sheet metal in copper, brass, aluminum, or gold. Animals have been represented in the art of almost all cultures since prehistoric times. Students will learn about animals depicted in the Museum's collection and then paint their own animals. Birds, a popular motif for many cultures and societies, will be explored during a gallery visit. Students will then create a painted and collaged image of a bird. During a tour of the Asian galleries, students will learn about Chinese culture, including the importance of dragons. Back in the studio, students will create a dragon based on Asian styles. Students will learn about the significance of symbolism in Colonial American portraiture by creating self-portraits, set in interior spaces. Their portraits will incorporate symbols reveal their individual narratives. Students will learn about illuminated manuscripts as a device for storytelling. Then they will create an illuminated letter based on the initials of their name. Students will learn about the purpose, subject matter, and style of the Impressionist painters by creating a landscape imitating Impressionist styles and themes. Students will create a low relief mask with the facial expressions of a character in a Greek play. Students will create a springtime collage using primary and secondary colors. After visiting the galleries to learn about stained glass, students will make their own translucent colored image. Students will tour the galleries to view Impressionist paintings. Then they will create a landscape or an interior scene in the Impressionist style. 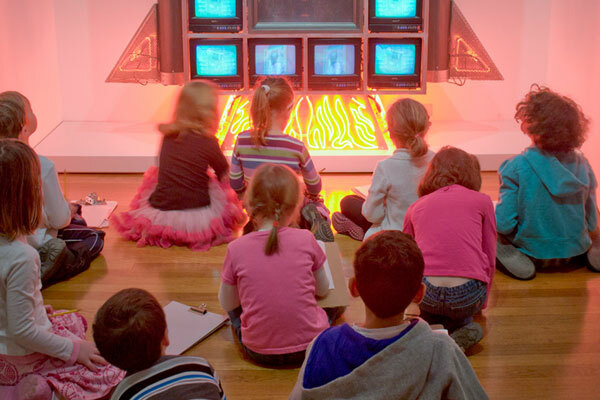 Students will visit the 20th century galleries to gain a deeper appreciation of modern art. Then they will create their own abstract still-life painting. After viewing still life paintings in the museum galleries, students will gain a deeper understanding of still life painting by arranging and painting a still life of their own. Students will create a personal fresco based on art viewed in the Medieval and Renaissance galleries. Students will learn about different styles of painting, including Impressionism, Abstract/Modern, and American before creating their own seascape painting. Students will analyze paintings and sculptures of women through several centuries of art. Back in the studio, students will create a painting about the role of women in contemporary society. After seeing Greek and Roman myths depicted in art, students will create collages focusing on gods/goddesses and inspired by the artwork they saw and the stories they heard. After viewing portraits in the museum galleries, students will learn about portraiture and figure drawing by creating drawings of themselves. After viewing portraits in the museum galleries, students will learn about the significance of symbolism in portraiture by creating self-portraits that incorporate symbols that reveal their individual narratives. Students will view depictions of animals in art, both real and imaginary. Then they will learn printmaking techniques to create a real or imaginary animal. After visiting the Egyptian galleries, students will be able to recognize the “Egyptian Style” in figures and images. Then, they will print a portrait or other subject in this style. Students will explore the arts of the Maya, Aztecs, and Incas. Using symbolism from these cultures, students will create their own brightly colored prints. After learning about color theory and shapes (both concrete and abstract) in the museum galleries, students will create a print exploring colors and shapes. Students will view sculptures in the galleries, and then they will create an abstract clay sculpture, focusing on shapes and colors. Students will examine similarities and differences among the ceramics of the of the Precolumbian, Greek, Chinese, and Japanese cultures. Then they will create a pot in the style of one of these cultures. Students will learn about the variety of ways animal images have been depicted by different cultures and times, then they will select a real or imaginary animal to create in clay. After visiting the Asian galleries, students will have the opportunity to use watercolors to learn simple Chinese/Japanese stroke techniques. Students will become familiar with the 20th century artist Louise Nevelson and her unique style of creating assemblage from repurposed wooden objects. Then they will their own assemblages. After a visit to the Greek gallery, Students will learn about Greek myths and art, especially figurative vessels, by using clay and appropriate techniques to construct a Greek vessel form. Students will paint the vessels to imitate red or black-figure ware, illustrating a scene from myth or everyday life. In the museum galleries, students will learn about different styles of painting including Impressionism, Abstract/Modern, and American before creating their own landscape painting. Students will view the mosaics from Antioch as they learn about Roman art. In the studio, students will design and create a mosaic tile pattern.